Symposium on Social Media and Regulation in Converged Environment | Škola komunikácie a médií, n.o. The main discussion regarding the role of regulation of social media focused on how to control the information posted (in terms of the spread of fake news and hate speech) and how to protect the vulnerable groups. The speakers of the Symposium agreed on the need for regulation, however, there was less agreement concerning how social media can be regulated in practice. The dynamics of the technological development seem to be much faster than the legal process, still in EU we can already see some positive results concerning various innovative forms of regulation. One of the good although controversial examples of regulation is the German Network Enforcement Act which obliges social media to report how many posts they have deleted. The fact that social media are large business companies could be one of the challenges in regulating them, thus one of the recommendations was to rather cooperate with social networks, let them create their own sanction system for violating rules by the users. The threat of overregulation should be also kept in mind as it can lead to the restriction of the freedom of speech. Increasing media literacy could be another effective way in raising awareness among users, making them less prone to consume fake news. The main challenge seems to be introduction of regulating Video Sharing Platforms within revised Audiovisual Media Services Directive, where Ireland will play a key role. There seem to be issues that should be discussed in more detail, such as Virtual Reality, Personal Identity and Digital Identity, as well as apparently overrated Artificial Intelligence. It was a bit surprising that no one tackled controversial radical Czech draft proposal on regulating social media in reverse order – to punish severely those who would delete posts by users (see materials PP 4.5a and PP 4.5b). No one pointed out at the radical non-regulatory suggestion originating from Australia (see material PP 2. 0). There was no discussion about past or recent examples of national courts intervention in regulating social media either (see on this materials PP 1.6 and PP 1.7), although the role of courts was raised. There were not present participants from the Czech Republic and only a single participant from Austria as well as from Poland (via Skype). Among local stakeholders, there was no one participating from creative industries as well as from publishers, broadcasters and local social media companies. Neither local policy makers showed any interest (representative of the Ministry of Culture appologied at the last moment). Welcome note by Vladimír Ješko, the vice-chairman of the Slovak Syndicate of Journalists, and by Andrej Školkay, director of the School of Communication and Media. Mr. Ješko supported the finding that individuals and technology companies have become more important curators of information and news than they were before. However, the legacy media –mostly audio-visual media and media websites –have a significant role to play. In fact, the news that is most read, shared, and discussed in social media is produced by professional news organisations. In particular, journalism is very much needed for the society. 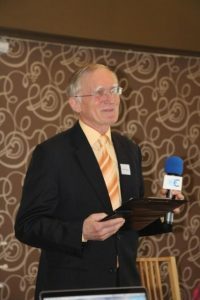 Viliam Figusch, the chairman of the Board of Trustees of the School of Communication and Media, and former representative of Council of Europe to Slovakia, also expressed his best wishes to the participants where he pointed the fact that journalism is the expression of freedom of speech, but at the same time, it carries some restrictions on member states. Indeed, the most dominant issue that researchers within this project encounter seem to be in conflict and an integration/merger of legacy with new media functions. The second most frequently tackled relationship is between private and public roles and issues. Andrej Školkay (discussion facilitator, SCM), Munir Podumljak (Partnership for Democratic Change, Croatia) and Oles Kulchytskyy (Association of European Integration, Ukraine) kicked off the discussion where Mr. Podumljak talked about pre-standardization, standardization, and regulation in general and the way it affects our lives. Mr. Podumljak said that the limits that existed are not here anymore (see on this material PP 2.1). Facebook breaks the rules – it is at the same time producer, distributor, and moderator of contents. In every other area of business that would be regulated (see for example, PP 2.7), governments let the market be the driver of the development without thinking what it means. He questioned the need for social media and the type of information which should be there (see on this material PP 2.4a or German language version PP 2.4b). The speaker mentioned two turning points: The first happened in the year 2008 during the Georgian war when a cyber-attack on governmental websites was used as a part of the Russian military strategy, and the second in the year 2013 when Robert Mercer, the CEO of Renaissance Fund, bought Cambridge Analytica to model the elections and predict seemingly unpredictable social developments. The context became unpopular to everyone, but it caused a huge reaction. In the end, the speaker emphasised that we failed in pre-standardization, standardization, and regulation of the social media today. He also stated that the society needs to address these threats in the right direction, otherwise it may cause some detrimental effect. He mentioned the power of social media Brexit and election of Mr. Trump for a US President, as negative examples. The second speaker Oles Kulchytskyy talked on the policy recommendations of social media prepared by COMPACT Project and disseminated before the event. The speaker said that the advantages of social media are known and appreciated but regarding its disadvantages, it can be harder to notice. In general, rather than enhancing life satisfaction, social media seems to foster materialism and dissatisfaction with life. 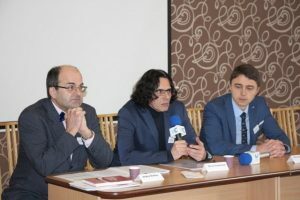 Fake news can be used in instances such as during the conflicts in Georgia or Ukraine or during elections campaigns in cyber-wars to form beliefs. Also, social media presents a picture of an ideal life and how it should look like which is not a real vision of life. It can cause depression among a large number of people that may feel vulnerable. It is as well the problem of economic growth since a big group of potentially productive young people is notable due to its mental depression to fully realise themselves, thus, to contribute economically to the well-being of countries they live in. The speaker emphasised the need to help these groups of people who live under the potential threat coming from social media and underlined the necessity to elaborate the protection tools regarding social media. Andrej Školkay later agreed with the previous speaker that social media can also be a threat to the society; he mentioned the importance of tackling fake news (see on this materials PP 2.6a and 2.6b and Slovak language version 2.6c) in terms of how they shape the society (with the example of 5-Star Movement in Italy). He pointed that suggested research findings (see material PP 1.1) and policy recommendations (see material PP 1.2) do consider neglected threats, e.g. when mothers, or parents in general, put photos of their children carelessly on social media, ignoring all dangers and privacy of their kids. However, Munir Podumljak questioned the actions people implement in the field of social media and he emphasised the need to get the definition of democracy since if it is an ambivalent term, anyone can be elected as the head of a state. After that, Oles Kulchytskyy pointed that the negative effect of social media may not be so visible but only to kids, as they are one of the most vulnerable groups of people that have to be protected. Daniel Milo (GLOBSEC) asked this: We missed the rise of social media which led to the rise of xenophobia and have we managed to deal with it? Since now, we can see foreign actors who interfere with our democracy and our values. Munir Podumljak replied that critical thinking is a part of dealing with this threat. Also, he pointed out that the interference into social media regulation must be carefully managed. Nonetheless, our societies were reluctant to craft the response to those threats. For the speaker, the actors involved in such cyber crimes should be treated as organized crime gangs and the ones who allowed it to happen must be persecuted. Andrej Školkay declared precisely that new technologies did not have standards and these have caused the problems we are facing today. He cited from the report findings that suggest that ICTs have the tendency to launch their own practices rather than to „follow“ the regulatory (pre) choices of the legislator. Yet, technical solutions cannot substitute the law. Miroslav Brvništ’an (The Police Academy) doubted whether we are able to regulate social media saying that our legal system is not ready for it and it might take years to adopt how to accommodate the dynamics into the legal system. He asked if we are able to set some basic functioning rules? Andrej Školkay disagreed saying that many actors like EU, for instance, have already achieved some positive results, being role models to the world, while for example, Russia is creating its own regulated internet space as well. Munir Podumljak went on to say that, Facebook, for example, got the monopoly which does not have alternatives in many countries and people did not react to it at the right moment. Tomaš Kriššák (Open Society Institute) questioned the issue on how to communicate the problems to the public – since it is a huge threat to our generation which people are not aware of. Replying to the question, Mr. Podumljak mentioned distorting realities and the high necessity of having different opinions and the need to disagree with some important issues to learn. Andrej Školkay wrapped up before the closure of the first panel saying that the issue is underestimated and there are some groups in the society that need to be targeted. 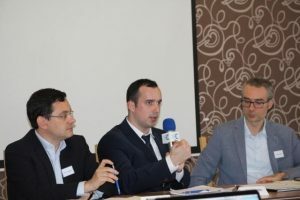 The second-panel session involved dealing with the issue of fake news and Nelson Ribeiro (The Catholic University, Portugal) Ivan Smieško (the Police Force), and Daniel Milo (discussion facilitator, Globsec) were the panelists. Mr. Milo kicked off the discussion by talking on the UK releasing an alarming report on fake news. In this report, it was written that social media personnel are „digital gangsters.“ He mentioned the key recommendations from this report. The first was: the compulsory code of ethics, then, legal enforcement of such regulations and the necessity to reform election campaign laws. Ivan Smieško spoke on his unique legal research on neglected issues, i.e. the possible criminal consequences of pressing reaction buttons on Facebook (such as love, like, laugh, etc.,). They are now the form of freedom of speech and the way to express the opinion (an example of «liking» the Holocaust denial article). So, as the speaker said, the usage of reaction buttons can be considered as a form of hate speech and it needs to be regulated. As Mr. Smieško mentioned, social media should not be treated as a wild animal which we want to control by using chains but in a cooperative manner. He pointed out that we have to deal with the consequences if criminal law is applied in such cases. The speaker proposed social networks should create their own sanction system when all users have to accept their rules and sanctions for violating the rules. So, when a user violates it, he is going to be sanctioned (see on this more in materials PP 2.2a and PP 2.2b as well as in PP 4.6). The following speaker, Nelson Ribeiro, challenged several issues. The first one is that the concept of fake news is very problematic and very ambivalent. He said that we used the definition but what does it mean? Where are its borders? Then, he continued by saying that news is considered to be journalism and fake news is fake journalism and fake news media is fake information. Thus, it erodes the real role of journalism in society. SM impact on journalism, distinguishing fabricated fake news and satire text. Fake news lead to fake journalism and then to fake minds. Yet, fake news began during the Cold War, if not earlier. The speaker also said that we tend to concentrate on political actors, however, it is not only the case since fake information nowadays also include companies which use it to take advantage over competitors. However, there also are users, who are willing to disseminate fake news. The last thesis mentioned by the speaker is that social media needs to be regulated. The social media platforms are not interested in removing fake news on their own initiative – these fake news and hoaxes are usually emotional, thus, interesting, and the users tend to disseminate them further on their own initiative, while social media platforms benefit from this commercially. He also argued that social media is like a business and all kind of business is regulated by some laws, so why omit social media then? At the same time, the issue of users kicks in and they are even harder to regulate. The solution appears not only fight against fake news and hoaxes via regulation but also throughout the increasing quality of journalism. In the future, algorithms and new technology on clouds will be able to write good articles and make videos or manipulate reality. And all will be speeding up. Mr. Smieško replied by giving the example of a Facebook user who was banned for 40 days. He said if something serves as evidence for prosecution by authorities, they should decide on whether to prosecute the person. And the question is whether it can be used since there is still the principle of free assessing of evidence by courts. This means that judges can select what they consider trustworthy and relevant. Then, Mr. Milo asked Mr. Ribeiro if this switch of decision-making of power to private companies is in full swing and how effective are these changes to the current codes of companies? Mr. Ribeiro stated that if we want to make it work somehow the push to regulating social media will be obvious but not be enough. So, if we want to make it function, we need to make people aware of how social media function and make them knowledgeable about the risks of fake news and disinformation. However, Mr. Milo asked Mr. Smieško a question if during his research any information was removed from the internet? Mr. Smieško then replied that in 2015 some anti-migrant Facebook pages were monitored and nothing was deleted. The speaker stated that social platforms did not deal with the content. However, some local politicians may pay for removing some of the undesirable information. Later, Mr. Ribeiro doubted that the impact of fake news is huge, but it is still a problem and there is a hope on the side of journalists. He questioned what is happening to the institutions who were responsible for producing honest pieces of information? He also pointed that institutions ( the media) which were the center of democracy are no longer functioning well. So, if we want to fight fake news we need to think about the role of journalists and media institutions. In his turn, Mr. Milo challenged the speakers by asking if they are possibly fighting yesterday’s war. Mr. Ribeiro provided the example of Brazil, where during the election campaign WhatsApp was used to disseminate fake information. It shows that while sometimes the discussion is focused on Facebook other platforms in which fake messages are more difficult to track are being used by those promoting disinformation. The speaker emphasised the necessity of media literacy. Also, he suggested that the fact that nation states cannot deal with these issues individually, as the platforms operate worldwide with Facebook having almost a monopoly since it also owns Instagram and WhatsApp. Stefanie Fuchsloch (Dortmund University of Technology, Germany) joined the discussion by explaining the principles of the Network Enforcement Act in Germany against hate speeches, determining what is fake news and where the line is (see more in this in material PP 2.3 and P 2.8). As the speaker said, the act was of a hot discussion in the country. Also, platforms have to report how much posted material they deleted (see material PP 2.19). The speaker pointed out that the discussion on what might be good is better on EU level than just on a local one. Mr. Smieško added that there is a diversity among EU states regarding legislation, and if we decide on EU’s legal norms, there should be set on minimum standards and then each state should decide on standards at the local national level. Nataša Slavíková (eslovenko NGO) asked Mr. Smieško how the developed reaction button will be developed. Mr. Smieško then explained that the usage of reaction buttons can be judged as a crime. If it is a crime, no need to judge from a material-legal point of view. Munir Podumljak said that 3 elements of government are integrity, accountability, and transparency; they are all failing. The speaker noted that media literacy may fail as well since we fail to educate the society on democracy, its goals and the way it functions. He also points out that citizens started to accept universal justice as granted. As well, he emphasised that the anonymity we used to have in the 1990-es on the internet is gone for good. Panelists (from the left side): Stefanie Fuchsloch (Institute of Journalism), Vladimír Bačišin (Slovak Section of Association of European Journalists), Daniel Modrovský, Slovak Syndicate of Journalist, Krisztina Rozgonyi (discussion facilitator, University of Vienna), Ľuboš Kukliš, (ERGA), Michal Hradický (Board for Broadcasting and Retransmission). Content regulation on the Internet in general, and in social media in particular, is hotly a debated issue from a global perspective. The reasons are obvious: high frequency of fake news and hoaxes, as well as, more recently, so-called social harm caused by teenage social media users (see material PP 2.13). There are conflicting interests in play. On the one hand, there are industry business interests; on the other hand, there are public interests related to ethics and security of nations and the safety for children. It is perhaps not surprising that a revised AVMSD was the most discussed topic during the second day of the symposium (see materials P P1.3 and PP 3.3). Krisztina Rozgonyi (Vienna University, Austria) kicked off the discussion by saying that 2018 platforms were under regular scrutiny and Germany adopted the first law in this area. So now, we can see the first results of it. On the EU’s level, there were adopted copyright directives (for international comparison, see PP 2.5). New regulations should be implemented in national laws in 20 months regarding online safety for Video Sharing Platforms. She also questioned how realistic EU’s regulations are and addressed the colleagues with the question of their roles in this process as journalists. L’uboš Kukliš (The European Regulators Group for Audiovisual Media Services, chair) argued about the importance of understanding the new regulation. The speaker stated that the media and state have always been important actors in this field but a new actor- user – was not appreciated enough. He stressed that there is now a societal need to protect users by implementing the protection of users’ rights. Mr. Kukliš as well pointed the shift in jurisdiction. Since many companies are based in Ireland, they are under Irish laws but cooperation among regulators is important too. However, according to the speaker, it is up to us to be responsive and work on good legislation. The discussion was continued by Stefanie Fuchsloch saying more details about Network Enforcement Act in Germany which imposed regulations on social media which have to report half-year on how much they deleted (see material PP 2.19). The speaker provided the example of Facebook which out of 1700 items deleted 21%. Mrs. Fuchsloch also pointed out that so far, there are no complain forms from users. The speaker also emphasised the dilemma – whether it is freedom of speech or subjects under the criminal code. If companies do not delete the items needed, they can be blocked. As the speaker said, there is no authority above it, and currently, another independent body is needed to regulate it (see materials PP 2.8, 2.9). Krisztina Rozgonyi asked the panelists what journalists and publishers could expect in the future. The first speaker was Daniel Modrovský (Slovak Syndicate of Journalists, chair) who said that Slovakia is a specific region and what works in Germany, for example, social media regulation without authorities, may not work in Slovakia or in other countries. There is still no clear definition of media and journalism in Slovakia. So to regulate, it is necessary to know about the media environment in the country first. Then, Krisztina Rozgonyi asked Mr. Modrovský on if things are to be made right internally, what would a journalist expect in regards to social media regulation. Mr. Modrovský mentioned that maybe it is in the future for now. However, he pointed out that the EU is making regulations harder. The speaker also pointed out that, for instance, in Slovakia, many people publish independently but we cannot do many things about that since we cannot approach these people in classical terms. Vladimír Bačišin (expert of the Association of European Journalists) continued the discussion by pointing at the two types of media such as the professional and amateur one. Amateur journalism is under the informal influence; not under official original regulation and not in the context of the official conduct of the journalistic duties. The speaker added that the precise ways the recipients get the information from the publishers are not known. Additionally, it is not yet known if this news is fake or not. Vladimír Bačišin said that the choice to compare information was there but now, the main problem is the work with the sources of the new news. He further went on to say that editorial offices in Slovakia do not function/work well, ethics is missing and editors fail. Then Facebook is the primary source of information for Slovak editorial offices. The editorial offices lack professional staff for checking info, recherché or documentary sections in the media. Mrs. Rozgonyi went on with the discussion that points at the issue of the internal problems in Slovakia which needs to be solved. She addressed the question of what could regulators do at least for users. Michal Hradický (Council for Broadcasting and Retransmission, Slovakia) replied that now we are not getting into written or traditional legal regulation and in media space, there are only targeted measures in specific context. The speaker added that the criteria for even definitions should be elaborated, and need to decide whether or not social media should be included. Later, the speaker stressed the growing importance of Irish legislation due to the fact that there are based the majority of the companies. L’uboš Kukliš specified the definition of the country of origin principle meaning the place companies providing the services are based. He pointed the need to have harmonized rules meaning that the rules must be the same in all EU countries. The speaker continued that some actors now can choose where to be judged in a court due to the differences in legal systems across the EU and it needs to be stopped. Mrs. Rozgonyi used the example of Holocaust denial prohibited in many countries and considered to be a crime, but it is not the case in Ireland. She asked her colleagues how the content uploaded in Slovakia would be regulated. The need for change was noticed by Mr. Kukliš. He supposed that it might be the court, however, pointed the problem of small countries since the big ones have no problem approaching such giants such Facebook (see also divergent opinions among small countries on these issues in PP 3.2). The speaker expressed the need to gather as EU regulators. Ewa Galewska (University of Wroclaw, Poland) joined the event via Skype. She explained how the regulation based on legislation works in communication and spoke about the EU’s initiatives to regulate the internet. She expressed the interest to see what will happen in the future and what trends will be. As for Poland, people are not prepared for such directives there. The speaker provided the example from last year when the Ministry of Digitalization published an Act on public information to adjust to new directives. She pointed out that the atmosphere was filled with criticism. In its turn, the Ministry stopped the initiatives, and there were no further steps to implement the directive. Mrs. Galewska said that it is necessary to keep in mind and respect that such bodies are not independent but politically influenced and regulation authors have no instruments in such situations. Mrs. Rozgonyi continued raising the issue on how to protect users and there she stated the bigger role of regulators. Mr. Kukliš replied that caring about the consumers is not enough and we need to think about democratic processes, and the services need to be more transparent. Stefanie Fuchsloch got back to the Network Enforcement Act stating that this Act helps transparency, demonstrating which criminal offence happened. However, being regulated on two governments’ levels, media and Act implementation should be more transparent for users. The speaker also underlined that it is debatable still since there is the discussion of how some items were wrongly deleted claiming to have the right to be heard. Munir Podumljak pointed out that justice cannot be privatized since it is against civilization principles; freedom of speech is one of these basic rules (see on this P 2.9). He also stressed the need to differentiate criminal activity and freedom of speech because users have the right to complain. Another participant, Ivan Smieško commented that users and accounts (on social media) are not the same thing and media can sanction accounts itself. The speaker spoke about the problems to persecute a person in Slovakia and the relations between a real person and the account he has. (There is PP 2.21 document among the files prepared by COMPACT Project tackling this issue). Mr. Kukliš replied that all the governments should be just and for the first time, there is a legal instrument that deals with users and contents. Then he moved on challenging the colleagues by saying if we are putting too many tasks on companies since, for example, Facebook is not a police. Then, he stressed the need for a hybrid solution. Mrs. Fuchsloch agreed with her colleagues stressing that right now there are more responsibilities towards contents. On the example of Germany, she explained that there are 21 definitions of fake news used in the country. At the same time, there are many more on the EU’s level of approach and so much work is yet to be done. Klara Szalay (Hungarian Academy of Sciences) asked about the minimum harmonization level and if there is a risk since the market in the EU is very different and the interests vary as well. L’uboš Kukliš replied to this question by saying that it is up to regulators but now everyone is more scared of the social media. He continued saying that there was very strong hesitation regarding regulations. Now, regulators are independent or at least should be (see material PP 3.1). But the rules are not that extensive. Michal Hradický discussed harmonization and disagreed that it is going to be similar as it used to be with broadcasting but going to cost more. But still, there should be minimum standards everywhere. The speaker also expressed his doubt that transposition would be achieved in time; it is in the process. Tomaš Kriššák asked what we are trying to achieve and the central role of new technological giants. In his turn, Mr. Kukliš replied that the companies only want to make money but they change the environment at the same time, thus, the rules which can protect the environment need to be implemented. Mrs. Galewska said she hopes the media space will not be overregulated since it is important to protect the freedom of speech. Annika Linck (European Digital SME Alliance, Belgium) kicked off the last discussion by saying that the regulation may change the scene in the future. She also noted that social media has appeared more than 10 years ago but we are still discussing it without knowing what precisely to do regarding their regulation. Andrej Školkay joined the discussion suggesting that regulators usually lag behind technological developments. He pointed out at the results of meta-analytical trends in social media, prepared under COMPACT Project, and the opinions of the representatives of local journalists. While the former document forecasts a need to regulate journalist, the latter representatives talked primarily on their internal issues. Moreover, fake news and hoaxes are more present in less polarised societies and with prevailing almost monopolistic liberal media discourse. This is situation in the case of Slovakia and the Czech Republic, while both Poland and Hungary show more polarised societies as well as the media, thus there is less room for alternative media and fake news/hoaxes (except, perhaps, those produced for political purpose by some politicians themselves). Igor Daniš (School of Communication and Media, Slovakia) stated the business model which could be a trend in the future ie. business with personal data. However, he emphasised on the need to change this model since the companies do not pay anything for data. Another problem is fake news since it began with this century and has already become a business model. Then, Lukasz Porwol (National University of Ireland) expressed his opinion by saying that people started paying for premium accounts to avoid ads and it might become a future trend helping to deal with fake accounts, it also leads to better quality of service. Mrs. Linck asked Mr. Porwol about the future of technologies. Mr. Porwol replied that data will still be there but will be used in a different way. The speaker stressed that Virtual Reality is a new way of communication, companies invest in the development of Virtual Reality or even in the acquisition of them. That will bring us new challenges too. However, he noted that the main problem to be overloaded with information for now. For example, communication is not always constructive (hate speech). Less communication but more meaning. Mr. Školkay explained that sometimes expectations from AI are too high. He provided examples of research on how AI can be used in fake news detection and debunking. Sometimes AI as a solution can be overrated. There are missing core data that would allow the comparison of AI-based tools used in this area. In fact, it appears that those most cherished may be the least efficient tools. Mr. Porwol stressed that communication development was always privately-driven. Companies had money and commercial incentives, so, it will never be public or the situation can end up like in China in the sense that it would be against the freedom of speech (social media credit system or social credit system). Mr. Školkay provided the example of Mark Zuckerberg who considered last year that it will take 5-10 years to develop AI while Bill Gates is more optimistic and thinks that this process is less time-consuming. Mrs. Linck wondered if AI can help handle fake news. The reply followed from Mr. Porwol talked on the need to have a digital identity (not the same as personal identity) because it would solve many issues – it will help public and commercial services to operate better. Mr. Školkay mentioned that AI as a topic is a good inspiration for discussion but we are not yet there. Also, Mr. Porwol doubted if it is under research possibilities. Mr. Porwol pointed out that one thing is to be identified and other is to be tracked. There are some limits but still means it can be followed by commercial companies. Mr. Školkay expressed his opinion that many lawyers underestimate the challenges of social media as well as AI and do not pay enough attention to them. Mr. Daniš said that there is the problem of headlines since they do not correspond with what is written in the text. Igor outlined that further research should focus on the comparison of social media in the historical point of view. He questioned whether the spread of false news and hoaxes by social media is the consequence of the existence SM or the decline in the quality of journalism, and the ever-increasing lack of pluralism of opinions and news in the mainstream mass media. From the historical point of view, it would be appropriate to examine whether there is only a different form of private speech in the social media (agora, forum, church, square, street, pub etc.) and a new model of the privatization of the public sphere by the social media. Lukasz Porwol disagreed with this idea. He said that not only there is a privatization of the public sphere, but also publishing of the private sphere. Afterward, Mr. Školkay mentioned – under normal conditions – the limited impact of media, including social media, on political processes (see on this material P 1.4). Mr. Daniš argued that social media is indeed a problem of journalists and traditional journalism is not open for other voices. Mr. Porwol replied that responsibilities for Ireland were a surprise, but it started to work with other countries (consort with 7 countries for now) and they try to address social media providers. There is a strong sense of common responsibilities and all countries are welcome for the opinion. Only together they can elaborate comprehensive decision. He mentioned that in a recent conference in Boston (USA) there was a change of attitude and presenters, including Mark Zuckerberg, supported a more responsible approach of social media platforms. The aim is to make communication more meaningful and less extensive. Munir Podumljak commented that anonymity was important in 1990s due to regimes that existed, so, people could say what was going on. Digital identity would not threat privacy but it is not regulated, however, we need it. Also, the speaker believed that people already live in VR since everything they do is online. But, VR requires tremendous transfer and energy capacities and we are not there yet. Then, he asked about the biggest issue with AI. According to his opinion, it is ethics because all people are different in moral ethics and have different beliefs. He also expressed the thought that people will stop developing AI at a certain point otherwise it could become destructive. Mr. Školkay replied that there are general concepts of ethics but the problem is among civilizations. While Asian civilisations prefer save the lives of the elderly ones in case of a car accident. Euro-American civilisation prefers the lives of kids to be saved instead. It is also an issue of standardization. Mr. Daniš raised the question on if it is possible to limit the access of children to social media. According to Mr. Porwol, the need for providing an ID when registering can solve this issue. Tomaš Kriššák asked about overall literacy of media because people are not aware of it. The solutions are not as easy as it seems to us. Mr. Porwol replied that some level of education is required and it should be introduced in the curriculum at schools and start as early as possible. Mr. Daniš discussed the problem now removal/stop of Russia Today. Is the action of RT freedom of speech is a piece of fake news? Mr. Podumljak argued that it is impossible to deny VR we live in it because the digital world is around us. People have the right to know who I am, they can judge, and know my position. When it comes to the news outlets there is no freedom of speech without editing. When newspapers publish content, they are responsible for it. And if it organized, it should be accountable. We cannot block Russia Today because it is Russia Today. We need the editorial judgment of what can be published and in this case, we need proper judgment whether some articles are under certain opinion or they are systematically spread fake news and they should be persecuted. But it should not come from Facebook but other bodies. 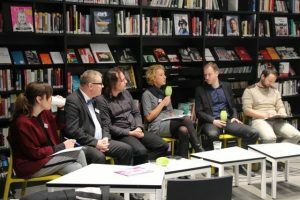 Klara Szalay commented that there is a trend of privatizing the public and private sphere. She also argued that from the economic point of view, it is an issue of monetizing data. Mr. Porwol claimed that some things do not have to be in private but in the right hands. Some companies in its base were built on monetizing data, we cannot stop giving data since we need those services. The problem is to insure companies financially in order to go on running services. Mr. Daniš agreed with his colleague on the threat of data misuse which can be very dangerous. Mr. Kriššák agreed since it is important to keep those services functional and growing and if we make them weak it is going to affect us first. If those services go from Russia or China it is of vital importance to think which other ideas could be behind. Mrs. Linck stressed that Facebook and Google dominate the market in terms of data which they collect it and it is obvious that they possess great power but luckily, they are closer to us in values, but it is still different since EU put more emphasis on privacy in comparison to its American counterpart. Mr. Porwol reminded that (cosmic) space programs used to be private but then private entities kicked in because the economy is getting interconnected. Mr. Podumljak stressed the monopolies and that they shall not exist. As an actor, Europe will have to play a big role because it has power. 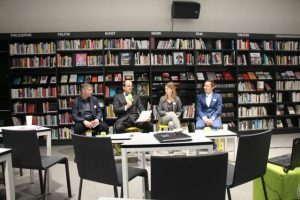 The Symposium was supported by Goethe Institute Bratislava, Slovak Syndicate of Journalists and Slovak Section of Association of European Journalists, within H2020 Compact CSA Project, financed by the European Union.